NEW YORK, NY.- To launch Rediscovered Masters, art historian Peter Hastings Falk presents Lost and Found: The Pinajian Discovery, the first in a series of exhibitions dedicated to deserving late career artists and/or those have passed on and whose achievements have been forgotten or overlooked. A stellar example of one such notable but neglected artist is Arthur Pinajian, a 20th-century American painter who died in 1999 at the age of 85 and whose much-lauded abstract landscapes in Lost and Found are are showcased in New York for the first time. The month-long exhibition of 50 paintings, which opens with a benefit for the Fund for Armenian Relief on February 13, runs through March 10 and is hosted by Antiquorum at the Fuller Building, 41 East 57th Street. After Pinajians death in 1999, five decades of accumulated artwork were found stacked up in the one-car garage and attic of the Bellport, New York, cottage he shared with his sister. He had left instructions for his collection to be discarded in the town dump. At the last moment an artist cousin refused to let the garbage truck haul away the paintings. Instead, Professor William Innes Homer [1929-2012], then dean of American art historians, was asked to examine the lifes work of the unknown artist and was stunned by what he found: a large body of extraordinary abstract landscape and figurative paintings by a highly gifted artist who was completely unknown in his lifetime. Homer urged Falk to head the project. Soon a team of art historians was conducting research into the life and art of Arthur Pinajian. As a boy growing up in an Armenian community in West Hoboken, N.J., Pinajian was a completely self-trained cartoonist. During the Great Depression he became one of the pioneers in a new medium: the comic book. In 1940 he created Madam Fatal, the first cross-dressing superhero, for Crack Comics. After World War II, he enrolled at the Art Students League in Woodstock, N.Y. For 22 years, his life revolved around Woodstock, albeit largely reclusive, while he passionately pursued his painting. His admirable poetic color combinations are linked to the tonalities of his better-known fellow Armenian, Arshile Gorky [ca.1904-1948]. Late in life, he moved with his sister to Bellport. There, he strived for visual and spiritual conclusions regarding flatness and color that parallel the goals of the Abstract Expressionists. It is interesting to note the astonishing resemblance between Pinajian and the hero in Kurt Vonneguts Bluebeard: The Autobiography of Rabo Karabekian, a 1987 novel about an eccentric painter. Both Pinajian and Karabekian, a.k.a. Bluebeard, were Armenian-Americans, raised by parents who survived the 1915 Turkish genocide of approximately one million men, women and children who then made their way to the United States where they raised their families during the Great Depression. Both men then served with the United States Army during World War II in the European theater, each earning a host of ribbons and medals, including the Bronze Star. After the war, both abandoned their careers as illustrators for higher artistic pursuits, joined the Art Students League in New York, and hung out with the Abstract Expressionists at the Cedar Tavern in Greenwich Village. Both eventually moved to Long Islands East End near the ocean, where they kept their paintings tightly locked away in a garage. Ultimately Pinajians work reflects the soul of a flawed, yet brilliant, artistic genius. 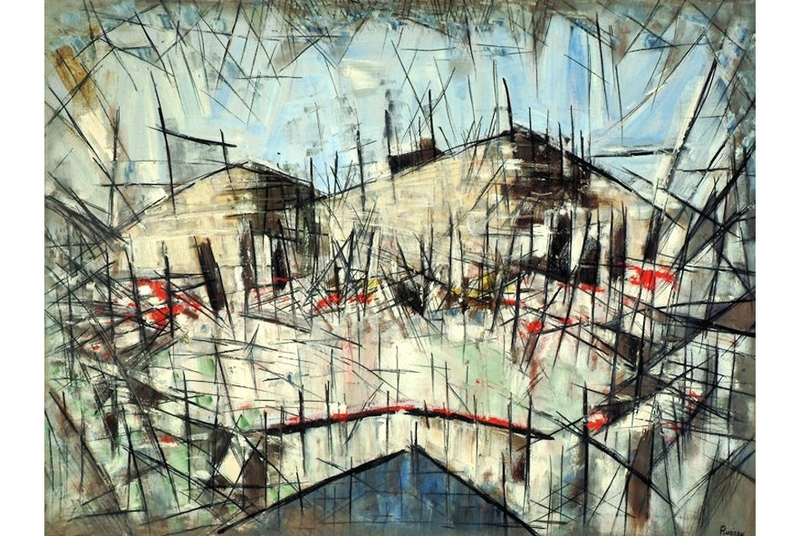 When he hits the mark, especially in his abstractions, he can be ranked among the best artists of his era . . . His life is, above all, a model for those who feel that they must follow their calling despite a lack of public acceptance, concluded Dr. Homer. According to Falk, Rediscovered Masters will provide a singular and valuable service for exhibition planners, connecting museum curators, gallerists, historians and critics with important, gifted artists about whom tastemakers might not be aware. Admission is by invitation only. Once an artist is admitted they are represented online with a thematic exhibition, a critical biography and other essays. Artists are identified through an Art Advisory Board composed of a cadre of museum directors and curators, art gallery owners, and other art professionals. The Senior Advisor is Peter Selz, former Curator of Paintings at The Museum of Modern Art and founder of the Berkeley Art Museum. Opening eyes while fighting ageism, Rediscovered Masters expands upon Falks 37 years of identifying and promoting excellent late-career artists and artist estate collections. Falk is author and publisher of what has long been regarded as the most exhaustive biographical dictionary on American art, Who Was Who in American Art, a three-volume opus that won the Wittenborn Award for the Best Art Reference Book published in North America, awarded by the Art Libraries Society. Falk also pioneered the documentation of art auction prices with his massive annual Art Price Index International and that data is now online at Artprice.com, the leader in art market information. The exhibition opens on February 13-March 10 at Antiquorum, 41 East 57th Street. Hours are 11 AM to 5:30 PM, Tuesday through Saturday or by appointment. Barbara Bloom, Ernst Caramelle, Anna Craycroft, Simryn Gill & Matt Mullican at Tracy Williams Ltd.